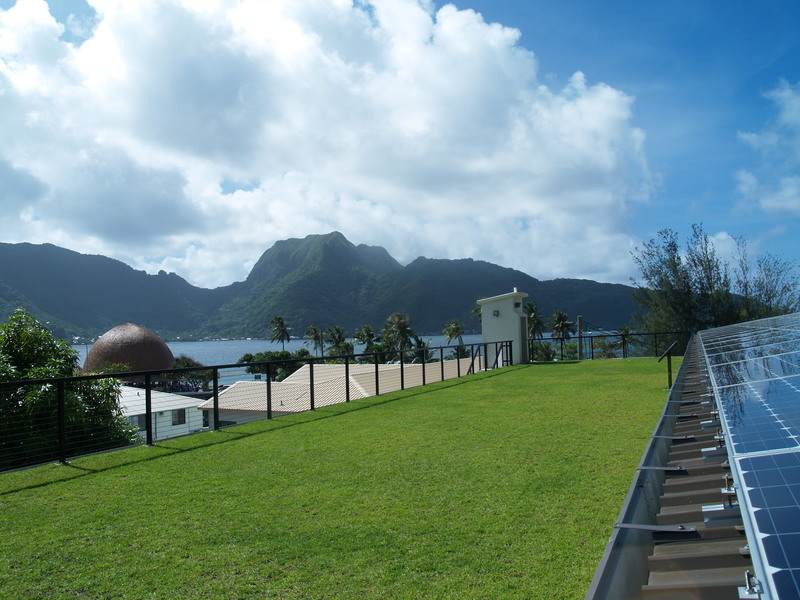 May 25, 2013, (Pago Pago, American Samoa) -- The American Samoa Environmental Protection Agency (AS-EPA) announced today that their new office building has been awarded LEED® Platinum. The LEED rating system, developed by the U.S. Green Building Council (USGBC), is the foremost program for buildings, homes and communities that are designed, constructed, maintained and operated for improved environmental and human health performance. AS-EPA achieved the highest level of LEED certification for implementing practical and measurable strategies and solutions aimed at achieving high performance in: sustainable site development, water savings, energy efficiency, materials selection and indoor environmental quality. LEED is the foremost program for the design, construction and operation of green buildings. Over 44,000 projects are currently participating in the commercial and institutional LEED rating systems, comprising over 8 billion square feet of construction space in all 50 states and 120 countries. AS-EPA’s building is the first LEED-certified building in the South Pacific and only the second LEED-certified Platinum project in a U.S. Territory. The AS-EPA Green Building project faced significant geographical, political, financial and design challenges that were overcome through the agency’s commitment to honoring its own environmental protection mandates. 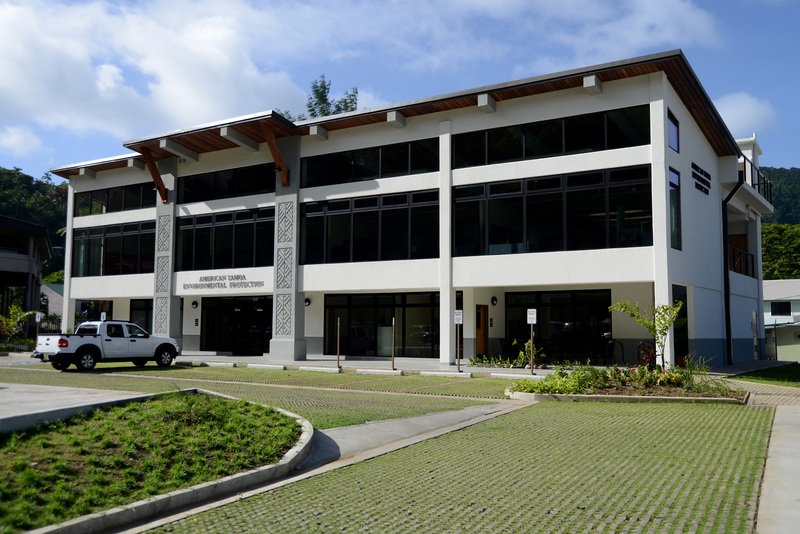 Thus the project began with an idea that a LEED-certified building would promote local green building capacity and serve as a demonstration for low impact development and best management practices throughout the Pacific Island Region. The guiding principle of the design was that it be "net zero impact," by capturing and treating it’s stormwater runoff and generating all of it’s energy needs on-site. The form of the building itself affords great energy savings. Interior volumes are shielded by a hybrid roof system comprised of a large photovoltaic array and vegetated roof absorbing direct solar gains and using them to cool the building through energy generation that powers cooling loads and green roof evaporation effects. The narrow east-west building orientation, together with the long veranda corridors on each floor channel the dominate winds, allowing for cross ventilation to keep the building’s outside corridors cool while providing daylight and outdoor views. The large south facing storefront insulated glass admits indirect (diffused) lighting from the floor level to the ceiling maximizing natural daylighting opportunities. The building’s lighting systems feature daylight and occupancy sensors limiting the artificial lighting loads. The 56-kW DC photovoltaic array is sized to produce approximately 100% of the building's annual energy needs. The building site location averages 120 inches of rain annually where much of the previous existing surface was comprised of hard packed gravel parking area that generated significant amounts of sediment laden runoff. AS-EPA insisted on capturing and treating over 80% of all stormwater runoff through the use of bio-retention ponds, sediment traps and permeable grass pavers. The use of outdoor ventilation, indirect/direct lighting fixtures combined with access to full spectrum exterior daylighting opportunities make this building’s environment one that is sensitive to the occupants’ physical environment needs. Additionally all occupied spaces maintain connection to the outdoors via large window viewscapes and view shed corridors. Occupants have access to showers promoting physical activities and alternative transportation options. Large green roof, veranda, and shaded landscaped areas provide occupants with easy access and connection to outdoor spaces. AS-EPA has a dedicated Education Division that promotes green building learning opportunities through public outreach, environmental awareness campaigns, media development and school program initiatives using the project as a working demonstration model. Both passive and active sustainable design educational elements are present in and outside the building in the form of signage kiosks as well as real-time P.V. array monitor display in the main reception area.